'Peaceful resolution' to conflict could only come through the 'cleansing' of Israelis from their country, says senior Islamist official. Senior Hamas official Salah Bardawil called peace talks between Israel and the Palestinian Authority (PA) "a disgrace Palestinian political conduct" this week, insisting that the Israeli "invaders" must leave "Palestine" to establish peace. In an interview with Palestinian news agency Quds Press, Bardawil said that Hamas leader's Khaled Mashaal's speech to mark the 66 years of "Nakba" does not imply any intention to agree to negotiations with Israel. 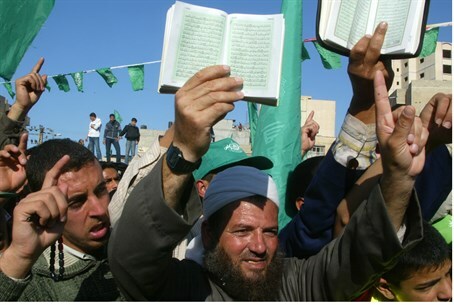 "Hamas's platform is known to everyone and is not unambiguous," Bardawil said. "Any referral to handling the Palestinian issue through peaceful means implies the cleansing of Palestine from foreigners who entered in 1948, before and after this time." "All those (foreigners who came to Palestine) must return to where they came from, and then we will extend our peace," he continued. "We are not hostile, only who attacked us and stole our land. So we understand the meaning of the word 'peace." Hamas recently "celebrated" Israel's 66th Independence Day with a genocide-themed video.The song in the video was to the tune of the Israeli national anthem, Hatikvah, which means “the hope” in Hebrew. The Arabic words of the song twisted that message, warning that it is “the end of the hope” for Israel, that Israel was doomed, and that Jerusalem will be renamed and known by its Arabic name, “Al-Quds." It also threatens to deport Israelis - or, worse, kill them. Several days later, a Hamas children's show encouraged children to "shoot all the Jews." And earlier this week, another Hamas publication threatened Israel's Jews - and immigrants - with genocide via political cartoon.